Shelsey Hall, a fourth-year studying philosophy and political science, and Sam Chan, a third-year studying political science and business administration, lead the Racial Climate Town Hall on Wednesday, March 6 at Witherspoon Student Center. The Student Government Diversity Outreach Department hosted a racial climate town hall on Wednesday, Mar. 6 in Witherspoon Student Center. Sam Chan, a third-year studying political science and business administration, and Shelsey Hall, a fourth-year studying philosophy and political science, are co-directors of the Department of Diversity Outreach. “This is actually a program we created where students can speak to us as liaisons between administration and students,” Hall said. Over 40 members of the campus community attended to openly discuss concerns and solutions for improving the racial climate at NC State. The town hall was prompted by recurring incidents of racist hate speech being made public, like the Theory incident earlier this semester and the GroupMe incident from September 2016. 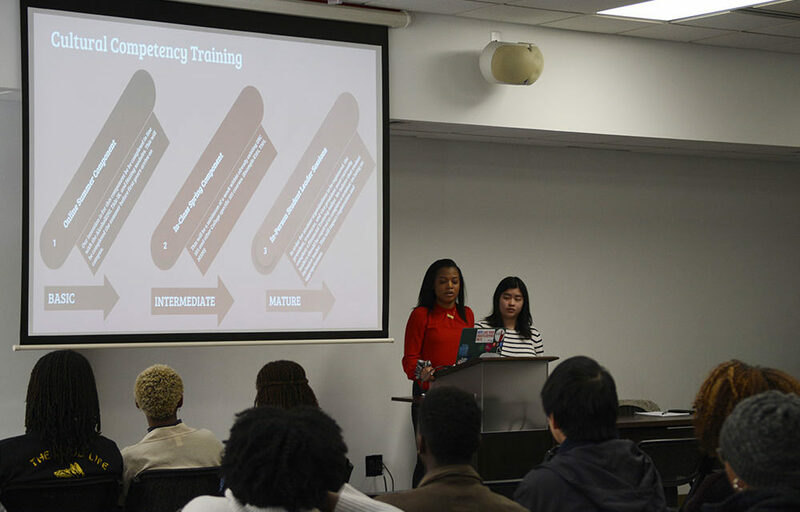 Chan and Hall proposed a series of initiatives aimed to promote cultural sensitivity and diversity, as well as prevent incidents of racism from occurring on campus in the future. One of these initiatives includes instilling required cultural competency training, much like AlcoholEdu, with online and in-person components for all students, staff and faculty. One attendee expressed their support for this initiative, saying the training “coincides with stricter repercussions because the person can’t say, ‘Oh, I didn’t know about it,’” when they commit a bias incident. Two other proposals were to amend the Student Code of Conduct or create a Code of Ethics that explicitly highlights the use of hate speech as an act with repercussions, and to reconstruct the Bias Impact Response Team (BIRT), a campus group dedicated to reviewing reports of bias incidences and finding resources for the impacted parties. After their proposal, attendees asked questions about the initiatives, suggested their own solutions and shared their personal experiences with discrimination and racism on campus in confidence. Jamila Simpson, the interim associate dean for academic affairs in the College of Sciences, suggested drafting goals and outcomes for the competency training and involving diversity officers from each college in the push for these changes. Attendees also raised issues of retention of minority students, staff and faculty and the general lack of awareness of groups like BIRT and resources centered on aiding marginalized students. Several people emphasized the importance of continuous student presence and engagement at meetings like the town hall if they want to see these changes implemented. “I was very proud of the student government diversity outreach group, and also students for attending. I’m proud because it’s very proactive and strategic,” Simpson added. In their next steps, Chan and Hall will continue advocating for these changes on behalf of the campus community in meetings with Division of Academic and Student Affairs, the Executive Vice Chancellor and Provost, college deans and diversity coordinators around NC State. “I’m really grateful for everyone that came out, spoke and gave feedback and thoughts and shared their stories,” Chan said. “These are things we need to be thinking about and need to focus on.